The Stibbert Museum is a unique experience. It is what is called a ‘house museum’. The museum is the former home of Frederick Stibbert (1838 – 1906). 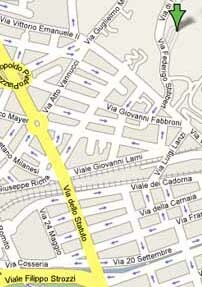 Stibbert was born in Florence to an Italian mother and English father. His family was very wealthy and had a strong military background. He used the riches that he inherited to cultivate his interest in collecting military items and other artifacts from all over the world, all of which make up the museum. The Stibbert museum is most famous for its armory collection. This is a must-see for anybody who’s interested in suits of armor and weapons of every type. Stibbert’s collection is mind-boggling in its vastness. It includes thousands of pieces of armor and weapons dating for the most part from the 16th to the 19th century. You can see suits of armor, breastplates, helmets, shields, defense masks, swords, lances, pole arms, sabers, crossbows, muskets, guns, and more (more on this below). The Stibbert museum is also fascinating because of the milieu that its eccentric owner managed to create. 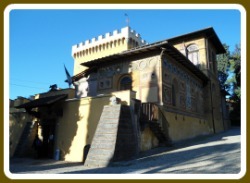 The simple building was adapted to look like a medieval castle. Stibbert put up a tower with merlons and decorated the outside walls with marble coats-of-arms. For each room he devised a theme and recreated a foreign ambience to go with the artifacts that the room would contain, invoking a specific historical period and cultural setting. For example, there is an Islamic room (left) decorated with stuccos meant to reproduce a part of a Moorish palace in Spain (the Alhambra palace in Granada). In this Arabian setting, scenes are recreated with mannequins using the armor and weapons so that the museum pieces are brought to life. Read below for more detailed information about each part of the Stibbert Museum. Stibbert’s collection includes European, Japanese, and Middle Eastern armory used for various types of tournaments and war games, processions, jousting events, and, for a few pieces, actual battle. Note: Stibbert’s collection dates, for the most part, from the 1500s onwards, a time period when the concept of battles being fought by soldiers in armor with lances, swords and shields was quickly becoming a thing of the past. At that time firearms had recently been invented and were taking over as the new equipment for engaging in warfare. The vast majority of Stibbert’s collection consist of armor and weapons used for ceremonies, shows or pageantry. 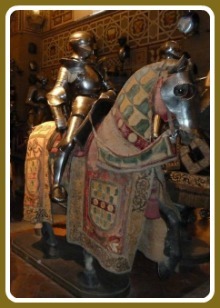 The collection of European suits of armor include suits worn by the papal and the Medici guards. The museum’s European collection also has a small selection of archeological findings dating back to Roman and Etruscan times which includes a magnificent Roman army helmet dating to the 1st century AD. The suits of armor in the Oriental section are completely different from the European armory. You are immediately struck by the lightness of the armor compared to the European coverings. The Oriental suits look like fine nets thrown over the body compared to the heaviness and stiffness of the European armor. These protective coverings also show a remarkable attention to intricate detail and finishings such as inlaid work of gold or silver. The Stibbert Museum collection of Japanese weapons and costumes is the largest of its kind outside of Japan. 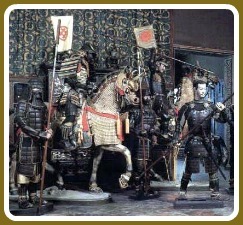 Stibbert recreates a cavalry of samurai on horseback heading into battle through the use of model soldiers and horses (left). Again, the difference in the suits of armor from this part of the world is striking. Japanese suits have a large component made of silk, which is tightly wrung so as to resemble leather or even wood. These protective suits show a rare mix of elegance combined with practicality. The bulk of the Japanese exhibit is dedicated to swords and blades, saber accessories, helmets, war and theater masks and armaments. Note: the Japanese rooms are only open with a guided visit on Fridays and Sundays at 3 pm and on Saturdays at 11 am. To see the Japanese collection you should book to ensure a place on the tour since groups are limited to 25 people. However, booking is not obligatory. Book through the web site (below) or phone: + 39 055 47 55 20. The Room of the ‘Cavalcade’ is one of the most spoken about parts of the museum. As Stibbert’s collection grew, his family house was too small for all his artifacts. Stibbert bought the neighbor’s house and joined the two homes into one mansion. The space between the two houses was turned into this huge rectangular hall which connects the two properties. The room is humongous and Stibbert used this size to create a spectacular scene: a cavalcade of horses, knights, and foot soldiers carrying out a procession, all inside this one closed space. The result is a very dramatic and theatrical effect. 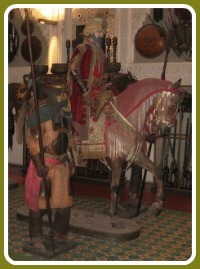 Stibbert displays his armory in a dynamic way – in action – as the soldiers are seen wearing their suits of armor and costumes, carrying their weapons, sitting on their adorned horses. What’s more, riders are not chosen randomly, but each horseman or foot soldier is a representation of a historical figure (eg. Emperor Maximilian of Austria, Prince Filiberto of Savoy, etc). The Hall of the Cavalcade is where you can see one of the museum’s most treasured pieces: the burial armor of Giovanni delle Bande Nere (Giovanni of the Black Bands). Giovanni, who died in 1526 from a battle wound, was a Medici, a courageous condottiere (mercenary), and father to Cosimo I de Medici who became the Grand Duke of Tuscany. Stibbert had strong ties to both Italy and England. He was born in Florence but educated in England, in Cambridge. After his studies, he returned to live in Italy. He showed his allegiance to Italy when he took part in Garibaldi’s expedition in 1866 during the campaign for a united Italy. However, Stibbert also remained loyal to his British origins throughout his life. Never having married, Stibbert had no direct heirs. In his will he left his museum, originally, to the English government. However, England waived its right to the Stibbert Museum thereby leaving this patrimony to the second beneficiary chosen by Stibbert, the city of Florence. During his life Stibbert also travelled a great deal. On his trips, he brought back collector’s items for what he referred to as ‘his museum’ from the exotic locations he visited. His journeys had a direct impact on his museum. When Stibbert visited Egypt in 1869, for the opening of the Suez Canal, he became fascinated by Egyptian culture. 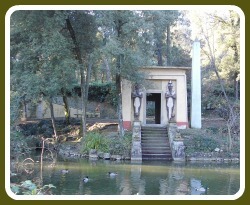 A temple with pharaohs that he had built can still be seen today in the Stibbert museum park (above). In the museum, there are also two Egyptian sarcophagi (dating to approximately 500 BC). Stibbert was part of the Florentine elite and had already made a name for his museum during his own lifetime, attracting the interest of such illustrious guests as Queen Victoria, during her visit to Florence in 1894, and Oscar Wilde. 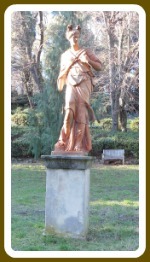 The museum is surrounded by a mysterious and evocative park that manages to be romantic and melancholy at the same time. Like the Stibbert home, the park is a mix of different styles. There’s a pavilion whose dome is prettily covered in colored majolica tiles, the Egyptian temple, narrow and wide paths and steps going up and down the hilly terrain and Renaissance style busts and statues. Some of these features are in need of restoration. However, it might be argued that this adds to the feeling of a ‘time gone by’ that the museum provokes. The Stibbert Museum Park is a woodsy retreat that is open to the public free of charge all year round. Although you can see paintings (mostly portraits) throughout the whole of the museum, at the beginning of the museum there is a large picture gallery, a room that was thought of specifically for the displaying of Stibbert’s painting collection. To the right as you come in the room there is a small balcony which Stibbert had built. This is testimony to the priority Stibbert gave to the appreciation of his artistic collection, having a terrace built within the room to provide a better view of the upper paintings. This collection has many replicas of known works (the most noticeable being the Mona Lisa, a very impressive copy) as well as some original paintings by the celebrated artists and Medici court painters Bronzino and Justus Sustermans. The Stibbert Museum also has a painting of Madonna and Child attributed to Botticelli. From today’s perspective, Stibbert’s home may seem overdone, brash, or even cheesy. The house is extremely crowded with elaborate artifacts, countless paintings, ornately decorated furnishings, even the walls are famously draped in floral painted leather coverings (yes, leather wallpaper!). The home is decorated in an enormous variety of styles, ambiences, materials, colors and designs which may even overload the senses but make you feel as if you're traveling through time and across continents. Since Stibbert set up his museum as a global display where scenes and environments from the past are recreated, there are several examples of mannequins dressed in period costumes. 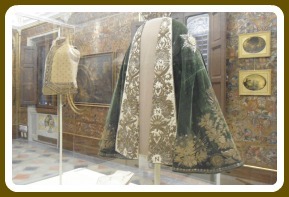 One special costume that is very exciting to get close to is the ‘Petit Costume d’Italie’ which belonged to Napoleon. This is the attire - cloak, breeches, and waistcoat made of silk, velvet and embroidered with gold thread - worn by Napoleon when he was crowned king of Italy in 1805 in Milan (left). The Stibbert museum has a large collection of ceramics and porcelain, much of which is imported from China and Japan. There is a room of antique plates all made by the renowned Florence Cantagalli factory. You can also admire porcelains produced by the most prestigious European manufacturers such as Meissen, Vienna, Sèvres and others. The Stibbert museum has accompanied tours which leave every hour (every half hour on weekends). The visit takes just over an hour and unaccompanied visits are not allowed. 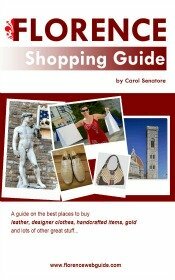 A good idea is to buy a guide book before you go in - at the ticket desk you can buy a very detailed guide for €14 or a shorter one for €6.50. Reading the detailed description of the rooms and objects can make your visit more meaningful (there are not many explanations for the displays). The museum realizes that some people may want to spend more time viewing the collection. For this reason, if, at the end of your visit, you feel that you haven't seen enough, you can - with the same ticket - take the tour a second time as long as it's on the same day. The museum is a little off the beaten path - about a 10 minute drive from the downtown area - but if this sounds like the type of museum experience that suits you, it is easily reached by bus, taxi, or even on foot for people who enjoy walking. Tip: there is a nice coffee shop, especially for pastries, just down the hill and around the corner from the museum (on the corner of via Paoletti and via Vittorio Emanuele). When you get to the bottom of the hill, go right. The coffee shop is across the street after about one block (closed on Tuesdays). for the most updated information on opening times and ticket prices see the official Stibbert Museum site. cost: €100 plus price of entrance ticket for a group of up to 25 people.